Earlier this summer I led a short workshop on Whittier.Domains and building your web presence for Whittier College‘s Poet Seminar Series hosted by Kristin Wiberg and the President’s office. What follows are some notes and slides from the presentation I had planned (technical issues meant my flash drive was not detected by the podium computer, so I went straight into the Whittier.Domains tutorial. I’ll offer a bit more introduction here. And apologies for the generic Powerpoint theme. I was on a bit of a time crunch. 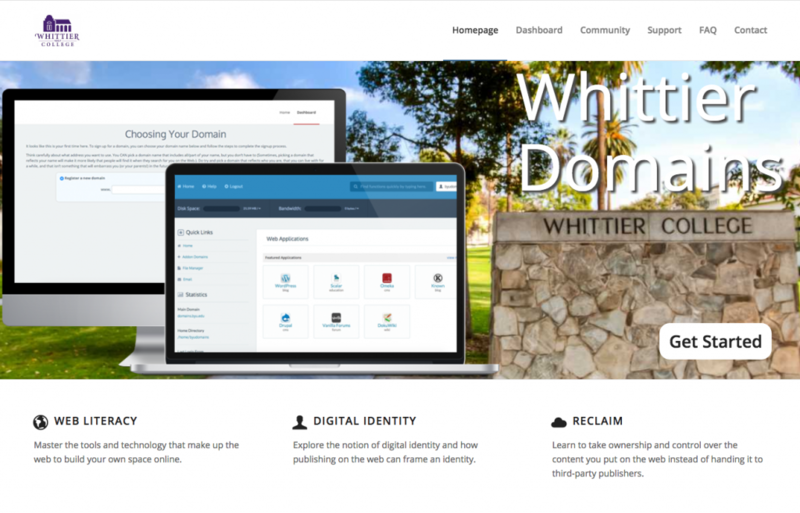 Whittier.Domains is a web hosting service offered by Whittier College DigLibArts through the edtech hosting company, Reclaim Hosting. Reclaim Hosting was started by Jim Groom and Tim Owens at University of Mary Washington, as a project to give students, faculty, and staff control over their own digital spaces, content, and identity. Through Whittier.Domains faculty, staff, and students at Whittier College can get a free subdomain (site ending in .whittier.domains) or they can take advantage of reduced domain hosting (.com, .net, .org), roughly $20, including additional security options. 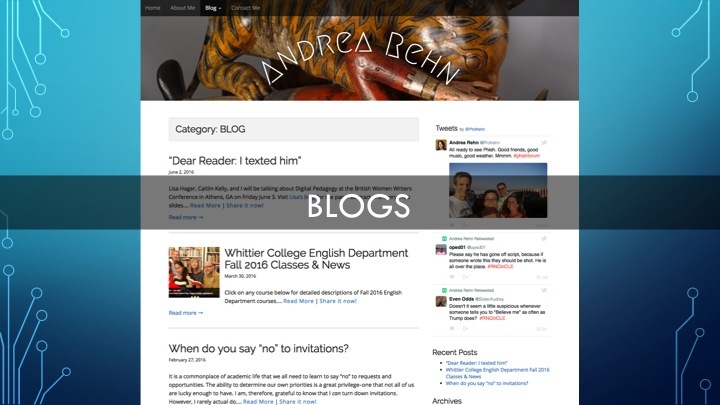 Here we have the example of Professor Andrea Rehn‘s professional blog where she documents her teaching and research. Blogs can be used to record research, professional experiences, or personal hobbies and achievements (cooking, traveling, fiber arts, etc.). 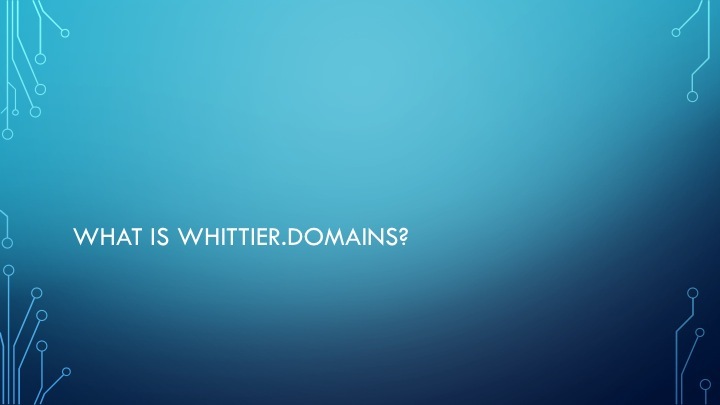 Depending on the topic of the blog, some might be more appropriate for affiliation with Whittier.Domains and Whittier College than others, and for those that are more personal in nature, we generally recommend registering for your own top level domain. If you’re ever confused, feel free to reach out, and I’m happy to consult with you. One important use for your own domain space is making a digital portfolio. For faculty and staff, this is an excellent way to highlight and share your research, publication, certifications and expertise. Students can also use their domains to highlight their education, experience, sample work, resumes, etc. to supplement job applications. This is especially true for students interested in pursuing careers in writing, art, or in the cultural industries where they may be expected to compile a sample reel, gallery, or other form of portfolio. These sites can also cohere an individual’s identity across multiple platforms and link to one’s LinkedIn, Academia.edu, Twitter, Youtube, Vimeo, Facebook, and more. 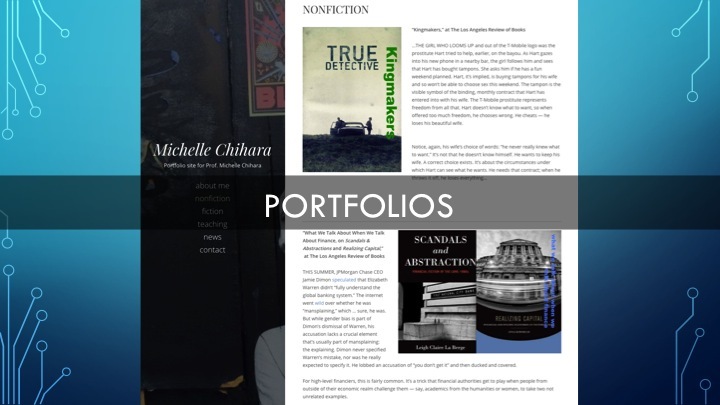 The example shown here is of the English professor Michelle Chihara who uses her site to share her published work. If you are a leader in an organization or advising a student org, your domain can also be used to host the group’s website, which is handy for publishing research, announcements, keep track of events and membership. 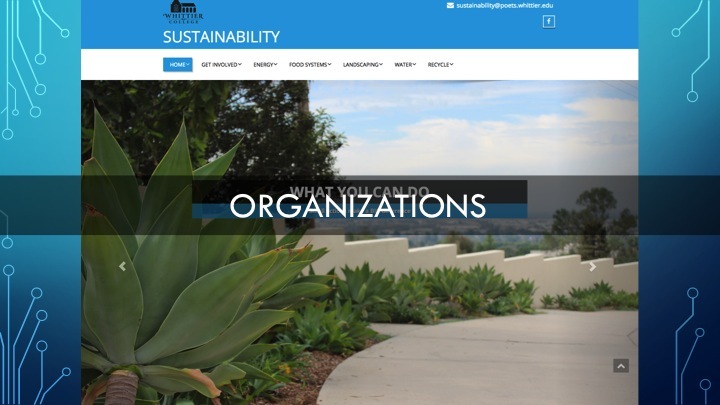 Above, we have a link to the Sustainability.Whittier.Domains site that students in an interdisciplinary class taught by Cinzia Fissore (many students also were members of the Sustainability Club). Students with no web design or coding experience put together this site while also taking a course and conducting field work. I’ve been hosting course websites on WordPress for years, and I often recommend this instead of institutional Learning Managements Systems (LMS) for contingent faculty and graduate students so that you can retain access to the sites after leaving the institution. There are other valid arguments both in favor of and in critique of LMS, but I personally like having a customizable public space where I can arrange course materials, where students can publish work for wider audiences, and where students can engage with each other outside of the classroom. 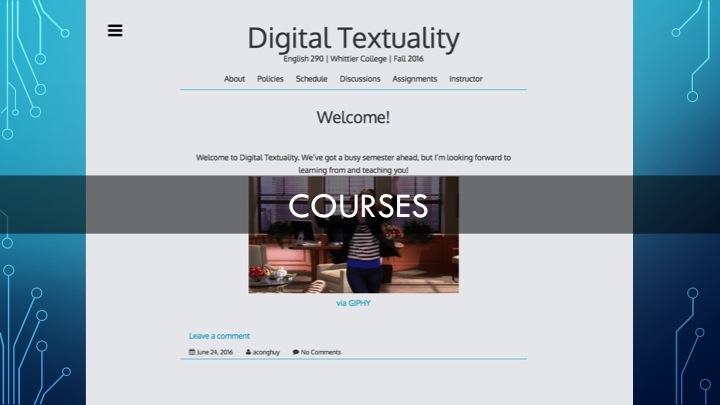 The site shared here is still under construction, but will be used for my Fall class, so for those who are interested, you can see as I post my syllabus, readings, and as students start to engage over the coming weeks and months. As researchers, it’s also important to have digital spaces to share information related to our research projects and programs. Here, I’ve shared the DigLibArts page, which most of you know is Mellon funded project that I help coordinate. WordPress is a valuable tool used by many academics and research collectives for hosting digital projects, academic bibliographies, reading groups, and more! There are many more ways in which you can use your domain, and for some additional examples, you can check out the “Featured Sites” section of Whittier.Domains, or you can schedule an appointment with me. Q. Should you go with a subdomain offered by the institution or a top level domain of your own? A. This can be a complicated question and will depend greatly on how much, and to what degree, you want your digital identity to be affiliated with the institution. Questions of academic freedom and intellectual property become important in these considerations. If you go with a subdomain we do ask that you use the URL that corresponds with your name and that you be sensitive to the fact that you are in many ways representing your role as a member of the institution on the web. You’re writing a blog, using social media to express personal opinions, using a pseudonym, etc. Q. What information do you collect from users? 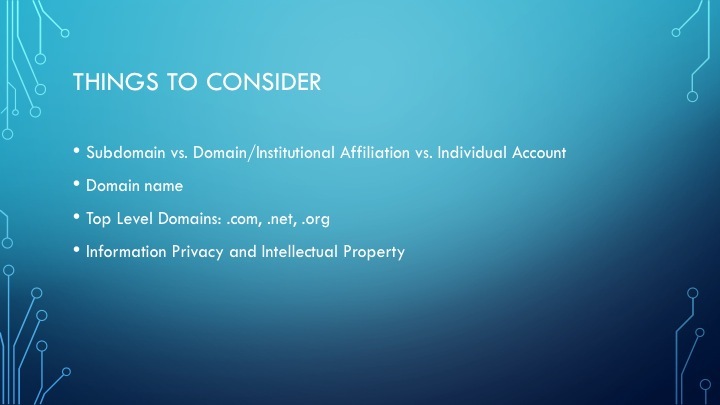 What are Whittier.Domains policies in regards to information privacy? 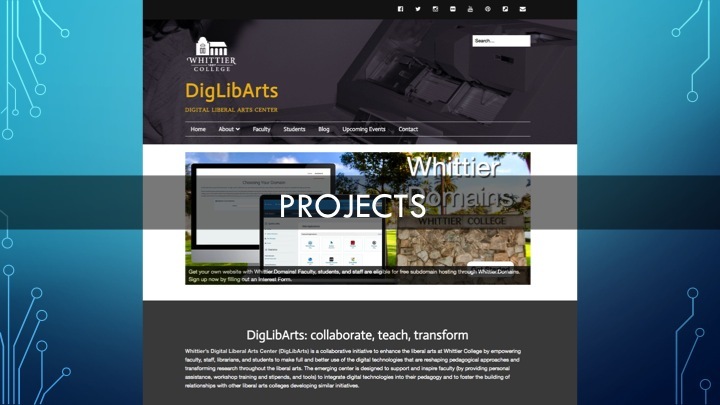 A. DigLibArts and Whittier College do not collect any user data from Whittier.Domains aside from keeping a general list of users (including username, email, display name, etc.). We won’t see when you’re logged in, for how long, or what you’re doing. The administrators of Whittier.Domains can access all sites hosted through the program, but we won’t unless the individual asks for help troubleshooting, if someone makes a complaint, or if individual users have direct questions about their accounts. Honestly, there are too many accounts in the system for us to be monitoring the contents of individual accounts. Q. What are characteristics of a good website? Do give us some information about you and the purpose of the site.Don’t Make visitors hunt for informationDon’t clutter your site with content (images, icons, clip art, banners, text) Do make it clean and easy to navigate. When choosing a theme, err on the side of simple. Do make sure the content is up to date, concise, and engaging! Don’t over do it! Most visitors to websites, make up their minds about whether they want to stay on the site or leave it within 10-20 seconds. It’s not enough time to read an essay, so think of ways to grab a visitor’s attention and point them toward more detailed information. Of course, there are many elements that go into making decisions for your website, whether professional or personal, and this is just the beginning. I encourage you to explore the Whittier.Domains, play and get your hands dirty in the platform, and reach out if you have any questions or want any assistance!